” Spinach? Yuck! who wants to eat it? ” was my expression at the table everytime it was served. Even popeye failed to convince me that spinach was indeed tasty! Now I try hard to recollect when exactly did I start liking this vegetable that I include in almost anything I can. Today’s lunch was pasta with spinach nut pesto. 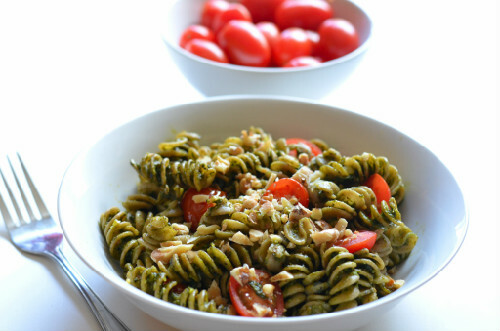 A flavorful puree of spinach, garlic, nuts and lemon juice tossed with fresh cherry tomatoes, pasta and Voila! you have a healthy delightful dish for anytime whether its lunch, dinner or a picnic. Here’s how I cook it….. In a pot bring water to boil. Add salt, and pasta. cook the pasta Al dente. (about 10-12 mts). Drain and set aside. Grind the nuts, garlic, spinach, black pepper powder, lemon zest, lemon juice and olive oil to a smooth paste. Heat a pan, add the cooked pasta, spinach pesto, tomatoes, and toss it on medium flame for about 3-5 mts. Adjust salt. Top it with more roasted and chopped nuts then serve it warm or cold.